It was a stunning spring morning as I drove west towards Corrie Hallie. An Teallach dominated the views from the ‘Destitution Road’ and I had to make a few stops to take photos of some of the classic views of the peak against a clear blue sky! As I wandered up Gleann Chaorachain spring was in full swing with fresh buds on the trees and a constant accompaniment of bird song. By a plantation near the top of the glen I saw a couple of young golden eagles swooping high above the trees. It was a steady climb up the glen with a big pack on but worth the effort on reaching the high point by a large cairn where the track emerges onto high open moorland and the peaks of the Fisherfield Forest burst into view ahead. From there I headed off on the rough path to Shenavall Bothy in Strath na Sealga. The bothy stays out of view until the very last minute, only coming into sight as you drop down to the bottom of a small side glen, but when it does appear, it has to be one of the finest views in the Highlands. Soon after passing the bothy I was onto the infamous river crossings, only ankle deep on the day and I made it to the estate buildings at Larachantivore for lunch. My route then took me up into Gleann na Muice Beag and off the main path to reach the remote Loch Beinn Dearg. I climbed high above the loch, eventually reaching the spacious bealach between Beinn Dearg Mor and Beinn Dearg Bheag in the early afternoon. I took a good break amongst large blocks of sandstone, then left my rucksack and ascended each peak in turn, starting with Beinn Dearg Mor. These are both spectacular hills, towering over the surrounding landscape, each offering stunning views out to the west coast with the Trotternish ridge on Skye leading to the Outer Hebrides. I watched the MV Loch Seaforth coming into Ullapool from Stornaway while sat at the summit of Beinn Dearg Mor, then watched it heading out again from Bheag. Away to the north, Morven in Caithness was a clear pyramid against the horizon. An Teallach took up the whole other side of the glen and the cirque of the Fisherfield Munros was in clear view with Torridon and the Cuillin rising beyond. I eventually dragged myself away just after 6pm. It was a quick descent to the bealach and then back down the way I’d come into Gleann na Muice Beag. As I entered the glen I plunged into the shade but it stayed warm. I reached the bottom of the glen less than 2 hours after leaving the summit of Beinn Dearg Bheag and set about pitching my tent in an idyllic spot at the confluence between the Allt Gleann na Muice Bheag and the Abhainn Gleann na Muice. Gleann na Muice is right in the heart of the Fisherfield Forest and this campsite had a suitably wild feel. Although I was on a little island in the river, the ground took pegs easily and it was perfectly flat. I enjoyed my dinner while watching the amber glow of sunset illuminating the surrounding peaks and then settled down in my sleeping bag for the evening with some reading material and a wee dram! It was a calm, clear night. I awoke at 4am and poked my head out of the tent to see a full moon over Beinn Tarsuinn at the head of the glen. It was incredibly bright. You could definitely have got on with walking without any need for a headtorch. There was no need to do that though, so I enjoyed the view for a few moments and then went back to sleep. By the time I did get up it had clouded over and was quite grey and overcast. Still not too chilly though, with only a gentle breeze and the summits remained clear. I was packed up and ready to go around 9.30am. I set off for a chilled out walk back to Corrie Hallie. The rivers went easily once more and I took a good long break at Shenavall which I had to myself – a rare event! Then it was back up and over the shoulder of An Teallach. It’s always a tough climb up out of Strath na Sealga but I made frequent stops to admire the views back to the hills, especially the Corbetts I’d climbed yesterday. I could tell there was a weather front on it’s way with the wind picking up from the southwest, thickening cloud and there were a few spots of rain, but it was pleasant conditions for walking and the cloud base was still above the tops. I made one last stop at the cairn above Gleann Chaorachain then plunged down the track back to Corrie Hallie. It was a shame to be back at the road but this was a great mini-adventure in one of Scotland’s remotest areas and I definitely found it an easier walk out with the knowledge that I’ll be back here again very soon! 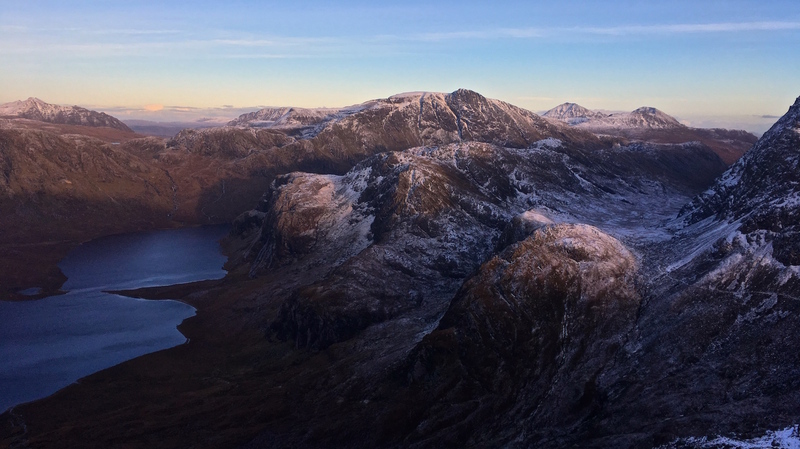 John King is a qualified Summer and Winter Mountain Leader and Rock Climbing Instructor based in the Highlands of Scotland, offering guided mountain trips, skill courses and climbing instruction. Copyright © King Mountaineering 2019. Designed by myThem.es.